Excellent customer service creates loyal customers for life; customers who are willing to refer your business to friends, family, and colleagues. Providing this type of excellent customer service starts with a genuine desire to delight your customers, but you also have to think beyond selling your products or services. You need to consider the cumulative experience your customers have when they visit your store or website, what they think and feel, and what you can do to make it better. Here are nine ways you can learn more about your customers and start to create a pattern of excellent customer service in your small business. In order to provide good customer service, you need to know what you're selling, inside and out. Make sure you -- and all of your customer-facing staff -- know how your products or services work. Be aware of the most common questions customers ask and know how to articulate the answers that will leave them satisfied. As they say, customer service starts with a smile. When you are in a face-to-face situation, a warm greeting should be the first thing your customers see and hear when they ask for help. Even when handling customer service requests via telephone, a smile can come through in your voice, so make sure you're ready to be friendly. Gratitude is memorable, and it can remind your customers why they shopped at your store or hired your company. Regardless of the type of business you have, saying thank you after every transaction is one of the easiest ways to start a habit of good customer service. It's important to make sure all of your employees, not just your customer service representatives, understand the way they should talk to, interact with, and problem-solve for customers. Provide employee training that gives your staff the tools they need to carry good customer service through the entire customer experience. 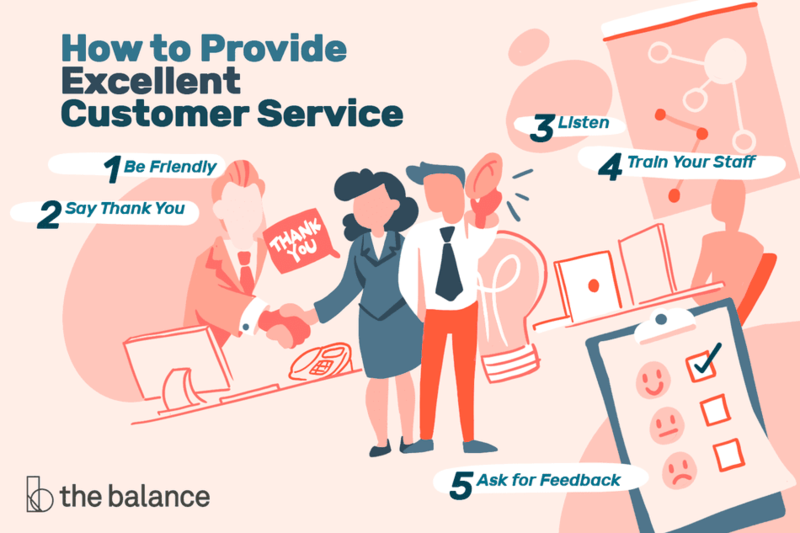 Customer service can often involve emotions, so it's important to make sure you and others you have handling your customer service tasks are always courteous and respectful. Never let your own emotions overtake your desire to see your customer walk away happy. Listening is one of the simplest secrets of customer service. Listening means hearing what your customers are saying out loud, as well as what they are communicating non-verbally. Watch for signs that they are displeased, while listening to what they say to you directly. There may be nothing worse than non-responsiveness to a customer who is trying to get help, resolve an issue, or find out more about what you're selling. It's important to respond quickly to all inquiries, even if it is only to say you are looking into the issue and will be back in touch. Some response is always better than none so the customer doesn't feel ignored. You may be surprised what you learn about your customers and their needs when you ask them what they think of your business, products, and services. You can use customer surveys, feedback forms, and questionnaires, but you can also make it a common practice to ask customers first-hand for feedback when they are completing their orders. You need to do something with the feedback you receive from customers in order to make it useful in your customer service process. Take time to regularly review feedback, identify areas for improvement, and make specific changes in your business. Excellent customer service often comes down to consistently checking in with your customers and making sure they are happy with not only the products and services you're selling but also the process of purchasing, ordering, working with you, etc. If you do that successfully, you are on your way to becoming known for providing excellent customer service.